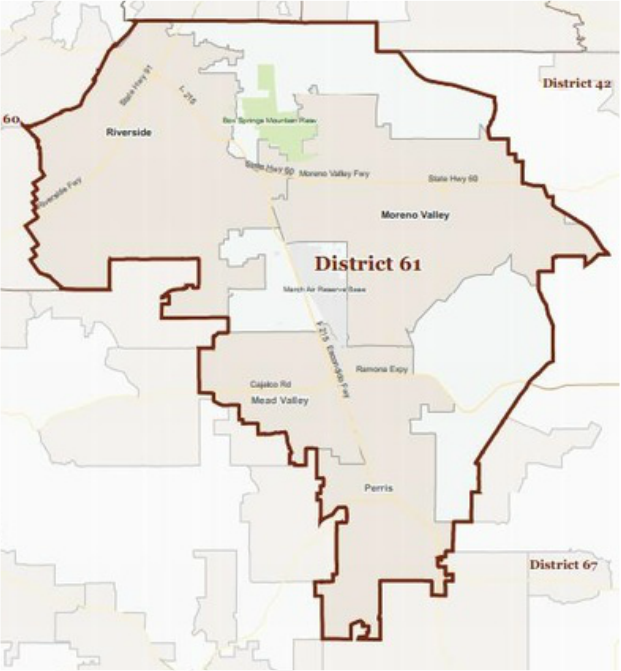 Democrat Jose Medina currently represents Assembly District 61 and will not be termed out until 2024. Medina is expected to win re-election in 2016. Assemblymember Jose Medina was elected in November 2012 to represent California's 61st Assembly District, which consists of Riverside, Moreno Valley, Perris and Mead Valley. Before being elected to the Assembly, Medina was a high school teacher with the Riverside Unified School District for over 35 years, a member of the Riverside City Teachers Association, and a representative to the state council of the California Teachers Association (CTA). Medina's eagerness to assist students beyond the classroom motivated him to pursue public office. He was elected to serve as school board member on the Jurupa Unified School District Board of Education and most recently, completed three successful terms on the Riverside Community College District Board of Trustees. During his tenure as a Trustee, he chaired the Teaching and Learning Committee and supported establishing independent colleges in Riverside, Moreno Valley and Norco. Medina's leadership was instrumental in expanding job-training programs, upgrading classrooms and science labs, and instituting measures to increase educational offerings. Medina recognizes the critical role higher education plays in supporting jobs and opening up the doors for opportunity. Education played an important role in Medina's life and is the reason he moved to Riverside more than three decades ago to attend UCR. In 1974, he graduated with a bachelor's degree in Latin American Studies, and went on to earn a master's degree in History. Medina is a three-time recipient of the National Endowment for the Humanities fellowship and was awarded a grant from the Organization of American States for research on Latin America. His extensive background as an educational advocate, respected community volunteer and accomplished teacher has earned him wide acclaim from all communities in his district. Medina was appointed by Speaker John Pérez to chair the Jobs, Economic Development and the Economy Committee. He also serves as a member on the Assembly Committees of Accountability and Administrative Review, Governmental Organization and Higher Education. Assemblymember Medina has two adult children, Jennifer and Matthew, and currently resides in Riverside with his wife, Linda.